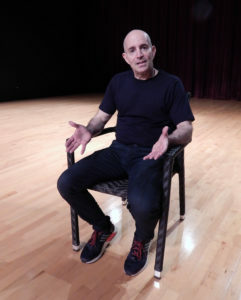 Brad Zimmerman will bring his hit New York Comedy to Ft. Lauderdale this season in his highly praised autobiographical comedy, My Son the Waiter: A Jewish Tragedy. The show will run from February 1 – March 25 at the Norma & William Horvitz Auditorium at the NSU Art Museum in Ft. Lauderdale. My Son the Waiter: A Jewish Tragedy is the story of Zimmerman’s struggle to fulfill his dream and ‘make it’ as a comedic actor in New York. One-part standup, one-part theatrical, and all parts uproarious My Son the Waiter: A Jewish Tragedy has garnered rave reviews wherever it has played, including sold out runs Off Broadway in New York, Philadelphia, Boston, Atlanta, Toronto, San Diego, Thousand Oaks, CA, Huntington Beach, CA., Palm Beach, FL., the Northshore PAC in Skokie, Illinois, The Gordon Center For Performing Arts in Maryland, the George Street Playhouse in New Brunswick, New Jersey, and dozens of other cities throughout the USA. Every mother dreams her children will grow up to be happy, healthy, and successful. Every Jewish mother secretly – and often not so secretly – adds specifics to her wish: A doctor, a lawyer, a dentist, or these days, a Silicon Valley tycoon would make her very happy. Brad Zimmerman’s mother has finally adapted to her ‘actor-waiter’ son’s career choice and financial situation: “If all goes well, I think Brad is going to buy a bookcase,” she boasts to her friends. Brad Zimmerman has paid his dues. He spent 29 years “temporarily” waiting tables in New York, all the while chasing a career in acting and comedy. He tells of his pursuit, along with stories about his childhood, family, and misbegotten love life with warmth, wit, self-deprecating humor, and wicked charm, and combines his years of training as an actor with his innate comedic talent. Zimmerman worked on the script for My Son the Waiter: A Jewish Tragedy for 9 years and performed it in small venues all over the country, including a stint at Florida’s Stage Door Theatre, where it came to the attention of producers Dana Matthow and Philip Roy (Respect: A Musical Journey of Women, Old Jews Telling Jokes, My Mother’s Italian, My Father’s Jewish & I’m in Therapy). Since then My Son the Waiter: A Jewish Tragedy spent 2 years at Off-Broadway’s Stage 72 (Triad Theatre) in New York, and has toured the USA from coast to coast. My Son the Waiter: A Jewish Tragedy will run from February 1 – March 25 at the Norma & William Horvitz Auditorium at the NSU Art Museum, Ft. Lauderdale. Tickets are on sale now, and are available on line at MySonTheWaiter.com or by phone at 1-855-448-7469. For group rates (12 +) call 1-888-264-1788. Tickets for My Son the Waiter: A Jewish Tragedy range from $45 – $65. For more information about My Son the Waiter: A Jewish Tragedy please visit http://mysonthewaiter.com or contact Carol Kassie at 561-445-9244 / Carol@CarolKassie.com.